So he wanted a brownie (at 10 a.m.) The answer was no. Then he wanted a Christmas cookie. The answer, again, was no. Then he wanted a "valentime". "Mom, so can I have one? Can I? They gots nutrition, right? You said they did." "Bud, what do you mean, silly? It's not Valentine's Day. It's Christmas." "You know - a valentime! I want one." (Somewhat kinda paying attention; but mostly not) "Honey, Valentine's Day is in February. Besides, you can't EAT a Valentine. I have no idea what you're talking about." "One of 'dose 'fings! You know, dat you peel that skin off?" Cute! and he has good taste. I love clementines. yum. Those are lemontimes at my house! omg so cute. can't wait to see you again! That is FABULOUS! I will be snickering about that one for a while! I love trying to figure out what little ones are trying to say. At my house the item pictured would be orenjjjes. Those fings are perfect this time of year. 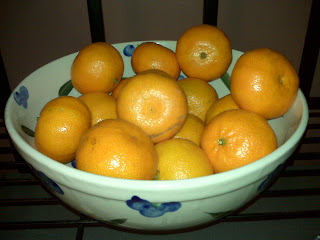 The grocery store closest to my house carries "Cuties" Clementines this time of year and we devour at least sack a week. I firmly believe Baby gets a Cutie just for being so gosh darn cute! Huge hit in our house, too. And fabulously on sale this year - for some reason I remember going broke last year buying them. I'm taking your advice and staying out of the kitchen. Smart.